Article as featured in Bury & West Suffolk Magazine October 2018 headlined ‘A Growth Business‘ about Woolpit Nurseries Growth Plant Nurseries business. 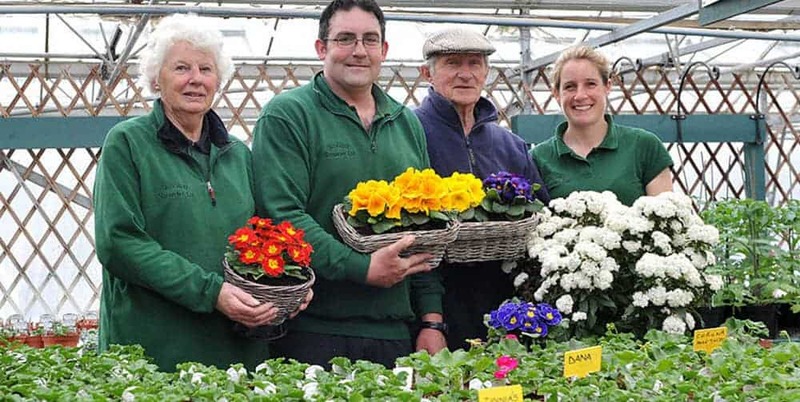 It’s all grow at Woolpit Nurseries and that’s just the way the family behind one of West Suffolk’s most successful independent garden-plant businesses like it! Initially taken on by husband and wife team Bob and Pam Jackson as a pre-existing tomato nursery in 1978, they expanded into bedding plants and hanging baskets 25 years ago. They are still involved but their daughter Catherine and son-in-law Andrew Brain joined the business in 2002 and are now at the helm. For all four it’s time to bake cakes and get out the bunting as 10th October marks Woolpit Nurseries 40th birthday. Typically though, their services are in such high demand that they haven’t got time to party. That’s no great surprise given that they grow 95% of their produce in situ, made up of an incredible 250,000 seasonal plants and 2,500 ready made hanging baskets for the general public, local authorities and businesses. “Other than large Italian plants, conifers, trees and Christmas trees, we grow everything from seeds, plugs or rooted cuttings,” explains Andrew as Bury & West Suffolk magazine is shown round the four acre site in Old Stowmarket Road. Being self sufficient in plants means that Woolpit Nurseries is not open all year. “Because we are a bedding-plant-nursery, we grow a crop, sell it and then have to close to start on the next crop,” explains Andrew. If you require any more advice, or want to see our large selection of spring and summer bedding plants, then please come and visit the nursery we are open Monday to Saturday 9am until 5pm, Sunday 10am till 4pm. Or you can Contact Us through our website.